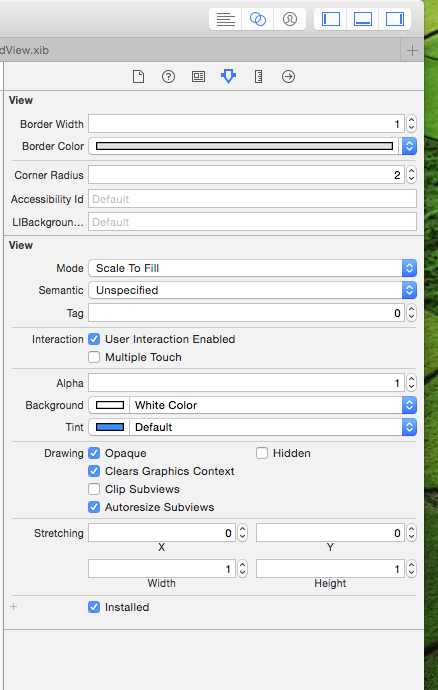 iphone storyboard - Cocoa Touch:How To Change UIView's Border Color And Thickness? You also need to link with QuartzCore.framework to access this functionality. I saw in the inspector that I can change the background color, but I'd like to also change the border color and thickness, is this possible? When I use Vladimir's CALayer solution, and on top of the view I have an animation, like a modal UINavigationController dismissing, I see a lot of glitches happening and having drawing performance issues. You can also create border with the color of your wish..
*r,g,b are the values between 0 to 255. I wouldn't suggest overriding the drawRect due to causing a performance hit. If you didn't want to edit the layer of a UIView, you could always embed the view within another view. The parent view would have its background color set to the border color. It would also be slightly larger, depending upon how wide you want the border to be. Of course, this only works if your view isn't transparent and you only want a single border color. The OP wanted the border in the view itself, but this may be a viable alternative. I wanted to add this to @marczking's answer (Option 1) as a comment, but my lowly status on is preventing that. I did a port of @marczking's answer to Objective C. Works like charm, thanks @marczking! With @IBInspectable you can set Attributes directly from within the Attributes Inspector. This way, your default View always has those extra editable fields in Attributes Inspector. Another advantage is that you don't have to change the class to MycustomView every time. However, one drawback to this is that you will only see your changes when you run your app. Click on the color slider icon, and then choose "RGB Sliders" from the drop-down list. You can also use the magnifying-glass as a color picker to pick up an exact color from anywhere on the screen; also see @ken's excellent comment below clarifying how colorspaces work with the magnifying glass. How do I enter RGB values into Interface Builder? Is it possible to change a UIButtons background color? How to customize the background color of a UITableViewCell? How to customize the background/border colors of a grouped table view cell?